Ch3 p02 | Kung Fu Meghan! This one made me chuckle although it may not be so obvious for everyone. When I was in college I had a friend who was from Japan and she taught me a few words of Japanese. 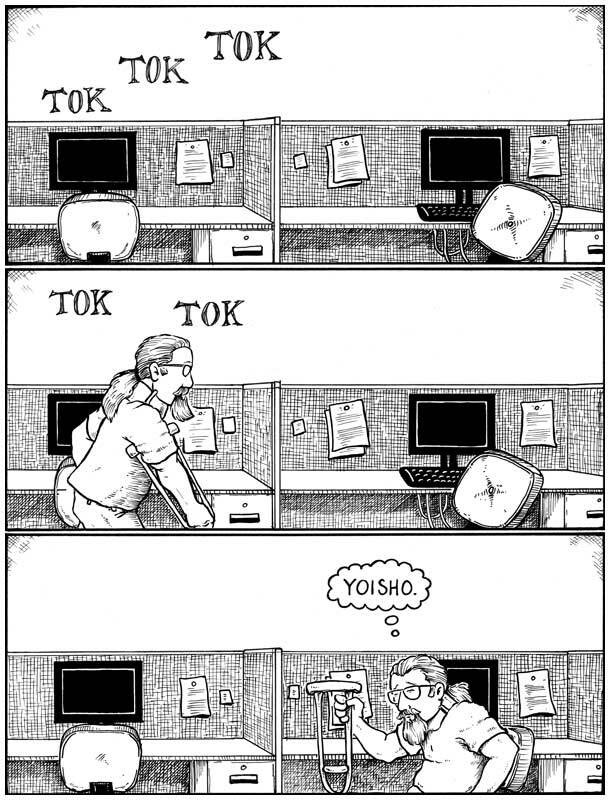 “Yoisho” is one of those words. The way she explained it, you say it right as you sit down as a sort of exhalation when you are tired and sore and sitting feels SO good. As she put it, “It sounds like old people”. That still makes me laugh and having the Ronin Glen come in with a neck brace and crutches after his fight with Mu Fanchu…well, it just seemed appropriate. Hey, free comic and bonus Japanese language lesson! How cool is that? Stay safe and I’ll be back next week with another update!